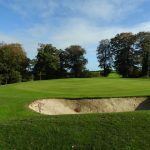 Bellewstown Golf Club is a Failte Ireland approved golf course, with breathtaking views of the Mourne Mountains and over the Boyne Valley. 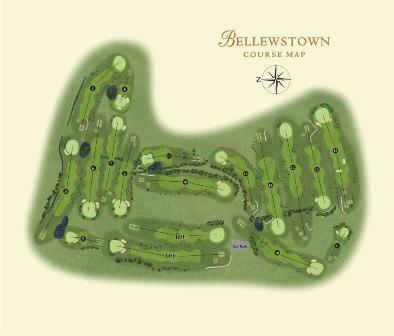 Bellewstown Golf Club Boasts USGA greens, mature trees and many exciting water features. You can also enjoy the breathtaking views up of the Mourne Mountains and over the Boyne Valley on this Fáilte Ireland approved gem. Bellewstown Golf Club is pleased to have fully qualified PGA Professional Mark O’Sullivan available for golf lessons. Mark was the Irish Amateur Close Champion in 2003 as well as representing Ireland at Boys, Youths and Senior level. 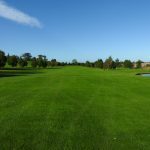 Achievements as a professional include being ranked in the top 10 PGA Professionals in Ireland, competing in the Irish Open in 2012 as well as winning the PGA Southern Championship. Mark offers lessons to players of all levels and abilities. He has an excellent understanding of the golf swing and prides himself on his communication skills. Taking a lesson with Mark will lower your scores and your handicap! We have a newly built top of the range driving range if you need to work your swing. Full basket of balls €7, half basket €5. 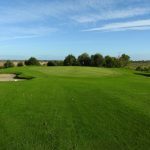 Our unique course was designed by experienced golf industry advisors Oliver Ennis and the late Nicky Ennis to take advantage of the lush grassland and sweeping topography of the East Meath area. 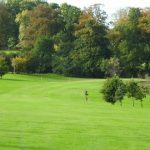 Not only do you get to take in the spectacular elevated view of the Cooley and Mourne mountains but you must contend with a challenging course. Dress Code: The standard dress code is smart casual. Tailored trousers and t-shirt with collar. General Courtesy: Be aware of others on the course. Players searching for a ball should signal players behind to pass as soon as it becomes apparent that the ball will not be easily found. Avoid slow play at all times. As a general rule, try to keep up with the group in front.  Distracting: Do not remove a club from your bag while a player is either addressing a ball or swinging, and never talk when someone is preparing to make a stroke. Never let your shadow encroach on another player’s field of vision as he/she is preparing to swing or making a stroke. TURN OFF all mobile phones while playing your round. 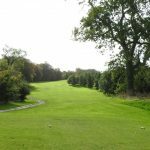 Right of Way: When starting on the 10th tee you must give way to those coming up the 9th as they have priority on the course. Course Ranger: The course ranger is there for your benefit and all players are expected to comply with his/her advice. Please follow any instructions that may be given to you. Hole 1: Par 4 The ideal tee shot is up the left side of the fairway shortening the approach shot to the green. The approach shot is up hill to an elevated green. 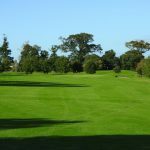 Choose plenty of club here to avoid coming up short and landing in one of the 2 large bunkers at the front of the green. Hole 2: Par 3 This tee shot plays longer than its 159 yards. The green is elevated and only the top half of the flag is visible from the tee. The green is large with 2 levels. There is plenty of room to the right and back of the green. Don’t be short as the bunker will grab any short shots. Hole 3: Par 5 A good birdie chance if played correctly. Longer hitters can carry the two large fairway bunkers leaving a long iron to the green. Shorter hitters should hit a 3 wood off the tee leaving them short of the bunkers and on the fairway. Avoid the two bunkers protecting the green with the approach shot and you wont be far away from the hole. Hole 4: Par 4 Keep the tee shot down the left side to find the flat part of the fairway. The key to this hole is the approach shot. 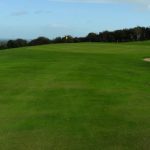 The approach needs to be aimed at the left side of the green allowing for the terrain to bring the ball back to the middle of the green. Anything leaking to the right may find the bunker or leaves a difficult pitch back up. Hole 5: Par 5, index 13 492yds yellows. A straight away tee shot. Only the very long hitters could go for the green in two. 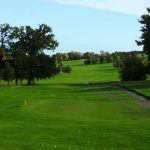 The second shot should be played down the left side of the fairway to avoid tangling with the trees short right of the green. The green breaks away slightly to the right so allow for this when playing the pitch to the green. If you don’t the ball may run off into the rough on the right of the green. Hole 6: Par 4, indx 7 373yds. The tee shot is as you see it. The green is set back 20 yards past the large trees. The approach shot needs to be quite accurate to avoid the trees and hazards short of the green. The green is a large surface so choose plenty of club for the approach and you will clear all the trouble. 4 here is always an excellent result. Hole 7: Par 4 index 12, 348yds yellow tees. A beautifully designed short par 4. Longer hitters may try to cut off a bit of the dog leg by driving down the left side close to the trees. Shorter hitters should play straight down the fairway to the corner of the dog leg. This leaves a short second shot to a small undulating green. 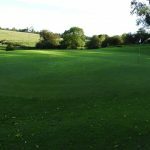 Take care with every putt on this tricky green. Hole 8: Par 3 index 6, 224yds yellow tees. The signature hole of the course. 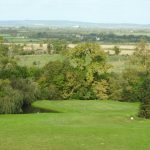 A beautiful yet very difficult par 3 played from a high tee to the green below. 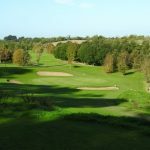 This 235 yard hole does not play its full distance as its considerably down hill. The lake which runs from the left side of the green to the front left grabs any ball which is short or left. The ideal tee shot should favor the right side of the green. 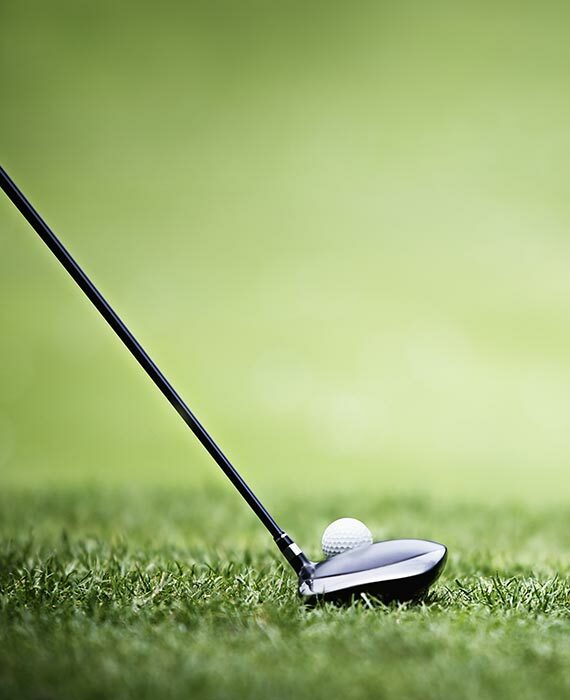 A ball which goes long right leaves a very difficult pitch to a small green. The correct choice of club off this tee is vital. The wrong choice may result in a large score on this difficult par 3. Hole 9: Par 4 The tee shot needs to be kept down the left side to give a good view of the green for the approach shot. The approach shot is up hill so take at least one extra club. Any approach aimed at the right side of the green will be fine. Anything that goes left will either find the deep bunker or leave a difficult pitch to a raised green. Take time out to get some refreshments at reception to recharge the batteries for the back nine. Hole 10: Par 5 More room down the left side than appears from the tee. Keep the tee shot down the left side leaving a better angle to approach the green. The green is large with plenty of landing area past the 2 large greenside bunkers. 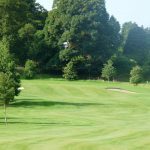 Hole 11: Par 3 Down hill tee shot that plays slightly shorter than its 172 yards. Be aware of the lake running around the back of the green. The safe play is to the front right side of the green. Hole 12: Par 4 Index 1 hole. Ideal line of the tee is just right of the tree on the left side of the fairway. The back half of the large green isn’t visible from the fairway. Choose plenty of club for the second shot as the water short right of the green will eat up any shots that come up short. Hole 13: Par 4 Dog leg right to a raised green. The tee shot should be aimed down the right half of the fairway leaving a shorter approach to the green. Take at least one club more hitting the second shot to the raised green. The green has a carefully placed tear running through it. Hole 14: Par 3 A short but tricky par 3. Try keep the tee shot aimed to the left side of the green. The natural slope will bring the ball back to the middle of the green. Any shots that drift to the right will end up in the large greenside lake. 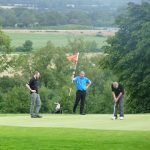 Take care with all putts on this green as there are many subtle breaks on all putts. Hole 15: Par 5 A challenging tee shot to being this long par 5. 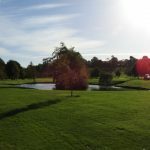 The tee shot needs to be kept on the fairway to avoid the lake on one side and the ditch and bushes on the other side. If the second shot is kept down the left side it opens up the green for the pitch to the green. The slightly elevated green makes judging the approach shot difficult. Hole 16: Par 4 The sloping fairway from right to left means you need to allow for the slope with your tee shot. 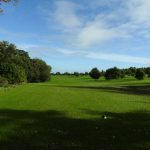 The approach shot to the green may be affected by the large over hanging trees on the right of the fairway. The approach shot plays slightly longer than its yardage so use plenty of club. Four is always a good score on this tough par 4. Hole 17: Par 4 The elevated tee gives a great view of the fairway. 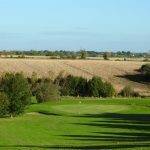 The ideal tee shot should be hit down the left side as the natural terrain will bring the ball back to the centre of the fairway. The approach to the green is very deceptive. The green sits below the level of the fairway giving the impression the flag is closer than it actually is. Always choose a club more than you think for the approach to this green. Hole 18: Par 4 A fine finishing hole that requires two good shots to get the green in two. The tee shot plays pretty much as you see it. The approach shot to the green is very much up hill. This approach shot plays at least 2/3 clubs more than you think. When you get to the green the work is not done. 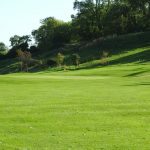 The green is large with many slopes and hills. Take time to read the break on every putt as a three putt will happen very easily if you loss your concentration.